Learn more about the multitude of applications that bring our filters to life. There is a class of fluorochromes that are intended to measure changes in the intracellular milieu, known collectively as ratiometric dyes. These dyes, such as fura, BCECF and beta-lactamase, are dual-excitation and/or dual-emission fluorochromes that have multiple absorption (excitation)/emission characteristics. In order to accurately measure changes in fluorescence, the use of filter wheels is often imperative, since switching between single-band filter sets would entail a risk of shifting the sample, and subsequent misalignment of the final images. As an example, fura-2 is often used to measure changes in intracellular calcium concentrations ([Ca2+]i). Fura is a dual-excitation fluorochrome, and absorbs differentially depending on its binding to Ca2+. When bound to Ca2+, fura exhibits an absorption peak at ~340nm, whereas in a calcium-unbound form, it absorbs at a peak of ~380nm. Typical fura experiments involve the use of an excitation filter wheel to alternate between 340 and 380 excitation filters. Fluorescence measurements are taken by using a 470-550nm bandpass emission filter mounted within the microscope. Post hoc image analysis is then used to compare 340/380 ratios (or calcium-bound vs. calcium-free levels of fura), which give the user an indication of [Ca2+]i changes within the cells. One specialized ratiometric application is FRET (Forster Resonance Energy Transfer) microscopy, detailed below. “Fluorescence resonance energy transfer”, or FRET (sometimes called “Forster resonance energy transfer”), is a phenomenon whereby an “excited” donor fluorophore molecule transfers energy in a non-radiative process to a suitable acceptor fluorophore molecule. This transfer of energy is termed “non-radiative” because it occurs without the emission of a photon from the donor fluorophore. Instead, it involves the direct transfer of energy of a donor molecule in the excited state when its fluorescence emission spectrum overlaps with the excitation spectrum of an acceptor fluorophore. The resulting FRET signal from the acceptor is often referred to as “sensitized emission”. FRET occurs between donor and acceptor molecules only after several conditions are met. First, the molecules must be sufficiently close – typically <10nm, but more often a closer apposition is required to successfully demonstrate FRET. This is the property of FRET which makes it such a powerful tool because such close apposition between molecules is often evidence that the two molecules are interacting. A FRET signal is direct empirical evidence of this close physical relationship, independent of the resolution of the imaging system and independent of conventional colocalization techniques. The Forster distance is the distance at which the efficiency of energy transfer is 50% – typically between 4-7nm, depending on the particular donor/acceptor pair, and is typically used to characterize the potential usefulness of a fluorophore pair. The efficiency of energy transfer increases exponentially as molecules become closer, and is exquisitely sensitive to the distance of separation. Second, as mentioned above, the excitation spectrum of the acceptor must overlap with the emission spectrum of the donor. Greater spectral overlap generally results in a greater likelihood of FRET, but also complicates the data correction/analysis because this increases the likelihood of false positive FRET as a result of direct excitation of acceptor molecules by donor excitation wavelengths. Third, the donor and acceptor molecule dipoles must be oriented favorably in order for FRET to occur. Not only must the molecules be sufficiently close, but the dipoles must be sufficiently aligned. Most often this condition is met randomly with large populations of molecules and a standard value for dipole orientation is used in most FRET calculations. FRET is an imaging technique which can benefit greatly by the appropriate choice of filters. In widefield imaging applications, donor excitation filters should be chosen to avoid direct excitation of the acceptor molecule as much as possible. While it’s never possible to entirely avoid direct excitation of an acceptor fluorophore, carefully chosen exciters will best exploit the difference between the excitation spectra of the donor and acceptor. For applications involving laser excitation, such as confocal and TIRF imaging, the most appropriate laser wavelengths should be used with appropriate laser clean-up filters. Likewise, emission filters should be chosen to best separate the donor /acceptor emission spectra. For example, in some cases it may be best to red-shift the acceptor bandpass to minimize the detection of donor fluorescence emission, while in other cases this will limit detection of the acceptor emission too much and will be counter-productive. Multi-photon excitation microscopy and FLIM (Fluorescence lifetime imaging microscopy) are other laser techniques often used in FRET imaging, each with their own advantages and disadvantages. Finally, FRET is a computation-intensive technique involving much image processing and image correction. It is not a simple technique by any means, and is best performed using systems with external filter wheels which afford independent control of excitation and emission wavelengths, or image-splitting systems where donor and FRET signals may be acquired simultaneously in live cell imaging. Temporal resolution may be critical in FRET, depending on the dynamics of the model system. Both approaches will require the use of Chroma’s polychroic mirrors which reflect multiple excitation bands and transmit multiple emission bands. Contact our Applications group for help in choosing the most appropriate filters for your FRET imaging applications (tech [at] chroma [dot] com). Total Internal Reflection Fluorescence (Microscopy) is a technique that was developed to restrict the background fluorescence and increase the signal-to-noise ratio (s/n) in the resultant images. This is accomplished in TIRF by using the ability of light to create an evanescent wave (or field) at a very limited range within the sample beyond an interface of two substrates differing in refractive index. In practice, this involves imaging a specimen that is in direct contact with a glass slide or tissue chamber. If the angle of the light is greater than the critical angle, this refractive index mismatch will create a field/wave with properties that are identical in frequency to the light. In other words, a fluorescent molecule that would normally absorb light at 488nm can be ‘excited’ by the electromagnetic field created by a 488nm laser (or other monochromatic source) that is reflected off of the lower refractive index material. Since this field will decay in intensity exponentially with distance, the resultant fluorescence signal will occur in less than 100 nanometers of the surface. This greatly reduces the z-axis signal and, as a result, significantly increases the s/n of the sample. Of course, this does mean that the molecules of interest must be within that limited range of the evanescent field. TIRF has been used for some time and in a variety of fields. The initial work done with microscopy was with prisms and beam steering devices to bring the laser/light to the sample from above using an inverted microscope design. The recent developments of "through-the-lens” microscope systems (via high numerical aperture lenses) has made the application much more available to researchers who do not want to align their systems nor worry about lasers shooting around the room. However, the “through-the-lens” approach to TIRF places an added burden on the filter/optics since the reflected beam is collected by the objective lens and follows the beampath backwards. This means that the emission/blocking optics not only have to deal with huge amounts of excitation energy, but also that this light can be at high angles due to scatter and reflections. A typical laser emission filter must block the excitation wavelengths to OD 6, but in TIRF, this blocking must exceed OD 8 in most applications (note that many modern spectrometers will not even measure to OD 8 across the full visible spectrum). Our solution is to use proprietary blocking mechanisms and optics to achieve OD 8, even at the higher angles of these systems. In addition to the added blocking requirements, the dichroic mirrors in these applications must be incredibly stable in reflected wavefront characteristics and flatness. Where a standard laser scanning confocal might require only a reflected wavefront distortion (RWD) of less than 2 waves per inch, TIRF applications require less than ½ wave distortion from the reflected surface. This reflected wavefront demand is after substrate coating as the coating process always exerts torque stresses on the fused silica substrates. This makes producing dichroics that meet these flatness requirements nearly impossible for some coating techniques and for some physical requirements of the substrates. We have found that using a modified magnetron sputtering coater, coupled with proprietary methods for stress relief and starting with 2-3mm thick substrates at 1/10 wave flatness, we can control the RWD to 1/2 wave. However, we have also had to design and produce our own cubes/mounts/holders for these commercial TIRF microscopes (patent pending), since the standard microscope cubes will not hold these thicker substrates and do not possess the ability to adjustment the dichroic angles that make the TIRF application more efficacious. Raman spectroscopy is an application used to study the rotational, vibrational and other low-frequency modes in a system. This technique relies on the Raman scattering (inelastic) of monochromatic light, typically from a laser source. The laser light will interact with the specific bonds and electron clouds of a molecule to create a virtual energy state. The laser light interactions with these phonons (molecular vibrations) in the sample will result in the photon’s energy being shifted up or down. These shifts in the energy level (different rotational/vibrational states exhibited as either longer or shorter wavelength photons upon relaxation from the virtual energy state) give information about the phonon mode and therefore information about the sample. The Raman scatter is so weak that the major challenge is to block both the intense laser light illuminating the sample and the Rayleigh scatter close to the laser in wavelength. Until recently this could only be accomplished with holographic devices using multiple steps of dispersion with the final signal going to a photomultiplier tube. This was difficult to align, expensive and slow. With the development of more powerful and less expensive lasers and the achievements in interference filter designs and better CCD cameras, the newer Raman spectroscopy devices are both less expensive and easier to operate. While Raman spectroscopy may be primarily used for chemical analysis (by recognizing the unique signal from different molecules and specific chemical bonds), it is also used in a wide variety of applications from materials science, crystallography and mineralogy to microscopy (also called microspectroscopy). As filter manufacturers, our greatest challenge is listed above: trying to reduce/eliminate the excitation light (direct or scattered) from reaching the detector. This happens to be true of all fluorescence applications but is even more important here, because the primary job of the emission filter is not to transmit the emission but rather to block the excitation load. It is also very important in this application, as it is in all involving lasers, that the laser source itself be ‘clean’ by restricting the output since many lasers have emissions well outside their stated emission points. We therefore recommend a laser clean-up filter (10-20nm fwhm) coupled with an emission filter that blocks this band to over OD 6. 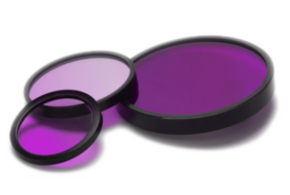 The dichroic mirrors in these applications must meet the requirements of the standard laser configurations listed elsewhere. Thanks to a unique arrangement of apertures, confocal microscopes provide an image at the detector that is a thin optical slice or section of the specimen. A sample that might be several millimeters thick can be reduced to a focal field of less than one micron in the z-axis, for instance. The field of illumination in the confocal is restricted by an aperture, typically called the pinhole. The field of view is also restricted by a pinhole, which is placed at the image plane conjugate to the illumination point and the first aperture. This ‘confocal’ configuration results in less out-of-focus light reaching the detector, which increases the signal-to-noise ratio by greatly reducing the imaging volume. Confocal microscopy was first developed by Marvin Minsky and described in a 1957 patent which used a stage that was moved within the beam of illumination light. The modulated light from the specimen was sent to a photoelectric cell for viewing with an oscilloscope. Illumination and subsequent detection were accomplished point by point by moving the stage. Minsky’s highly original ideas would eventually revolutionize microscopy. While Minsky’s patent was approved, several technical difficulties remained. Due to the restricted apertures, his system required a very intense light source. Lasers did not yet exist and there was no other light source intense enough for fluorescence at the time, given the loss due to the pinholes. While Minsky used a long persistence oscilloscope for viewing, there was, at the time, no way to faithfully record the image. It took other inventors and further developments for this special microscope to be useful to the average investigator. The development of intense monochromatic light sources — lasers — solved the illumination problem. Computers equipped with digitizer boards made recording and displaying the image trivial. Today, the modern scanning confocal uses a laser, or combination of lasers, for the illumination source. The scan is now done by carefully controlled galvanometer mirrors that move the diffraction limited spot of illumination across the field in a raster motion, similar to a television set, controlled by the computer. The scattered, reflected fluorescence light from the sample is sent to a photomultiplier tube (PMT), while the image is formed onto a computer screen one point (picture element, or pixel) at a time. While Minsky listed many advantages of the confocal, perhaps the most important feature is the ability of the scanning confocal microscope to optically section the specimen. Historically, the finest details of a cell or tissue were achieved by fixing the tissue and then carefully cutting it into very thin sections for viewing or imaging. This process required killing the specimen, and could take an investigator years to perfect the technique of microtomy required to cut a section thin enough to image. Confocal's optical sectioning characteristic allows users to image thick tissue without the skill of microtomy. It also allows users to image living cells, tissues, and organisms with very high resolution. Live cell imaging has therefore become an important subset of confocal microscopy. This optical sectioning ability also means that the individual slices/images can be saved in the computer and then reconstructed to show the three dimensional portrait of the sample. This is a very important characteristic of the laser scanning systems now available. This system does place some unusual requirements upon the optical elements used for fluorescent imaging. A major misconception is that the laser light output from a specific laser produces only one wavelength. In reality almost all lasers produce harmonics and/or scatter of other wavelengths. While these secondary lines may be very weak in intensity compared to the primary line, they can, nonetheless, greatly reduce the signal-to-noise ratio. If the fluorescence emission happens to be in the same wavelength region as the harmonic (or other noise from the laser), the fluorescent signal may be completely masked, rendering it invisible. The first element in the beam path is a laser clean-up filter, which is a modified excitation filter. Due to the collimated, coherent nature of the laser light and the relatively small size of the beam, this optic should be ground and polished. This is in contrast to a wide field microscope, which does not require polish and grinding. The clean-up optic should also have very good transmission characteristics, including wavefront distortion of less than one wave per inch. The wedge (the deviation from perfect parallelism of the optic’s outer surfaces) should be minimized to less than an arc-minute, so that different clean-up filters may be used in the same system without the need for realignment. The clean-up filter is typically 10nm at full-width half maximum (FWHM). It blocks all other light from the laser source (the maximum range would be from UV to 1200nm) and is antireflective (AR)-coated for maximum transmission. With the new, more powerful lasers now available, AR-coating may not be necessary for transmission efficiencies. However, these optics are made using interference layers with maximum reflection characteristics to avoid thermal damage, therefore the AR-coating will decrease surface reflections. These reflections should never be allowed to reflect back into the laser cavity itself. Therefore, these optics are designed to be used at 3.5 to 5 degrees angle of incidence (AOI). Diode lasers are known to shift slightly in emission wavelength as they warm up, and we therefore recommend a clean-up filter that is 20-25nm wide for these sources. The dichroic/dichromatic beamsplitter in a confocal is selected for higher flatness specifications to improve wavefront distortion when compared to epifluorescent illumination systems. Both are typically specified at better than one wave per inch, but some laser systems may need much better characteristics. There is also an increasing demand for transmitted wave front specifications, which typically calls for thicker substrates. It is not unusual currently to make dichroics on 4-6mm thick fused silica substrates. As lasers have increased in size considerably over the last few years, there are also concerns that this increased power load may destroy the primary mirror. In well designed dichroic optics, this is not a problem, at least up to 8-10 Watts with common beam sizes. Mirrors are all AR-coated to minimize beam spot reflections and to maximize transmission. Polarization is also another consideration with regard to mirrors. Since all optics at an angle to the beam path can act as polarizers, this becomes particularly important when considering the fact that most laser sources are themselves polarized. As in all fluorescence, the primary duty of the emission filter is to block the excitation source. In confocal systems, this blocking does not involve as wide a region of the spectrum, typically, as compared to epifluorescence. However, because of the power output of the laser lines, blocking may have to be specifically designed to be greater (perhaps above OD 8) at the particular wavelength of laser emission. The actual design of the emission filter for a confocal is still somewhat in debate. Since the detector is most often a PMT, where the image is formed one pixel (picture element) at a time, these emission filter optics do not necessarily have to be ground and polished. However, due to the increased resolution standards placed on the confocal image, most feel that grinding and polishing, like common emission filters, is not wasted effort. There has been some evidence recently that an emission filter with a large wedge (beam deflection) may contribute to inaccuracies in morphometric measurements, which may be exacerbated by a long emission beam path. Qdots (or quantum dots) are fluorescent crystalline constructions that are most strongly absorbent in the UV to violet region of the spectrum, but emit, depending on their size, through the rest of the visible and near-IR. Chroma worked specifically with the original Qdot Corporation during the initial development of Qdots to generate filter sets that were optimal for their detection. Chroma carries a number of Qdot-specific filter sets that differ in the width of excitation and emission light transmitted through the various optics, depending on the needs of the user. The most common Qdot sets contain a shortpass excitation filter that transmits ~340-460nm and a 40nm-wide bandpass emission filter centered on the peak emission of the individual Qdot (e.g. 565/40 or 565+/-20nm for Qdot 565). Less common sets use narrower excitation filters (e.g. 405/90 or 405+/-45nm, or 420/40 or 420+/-20nm) in order to minimize the impact of UV excitation light-driven phototoxicity in live cell imaging, or in instances where UV excitation is not desired. The most common Qdots are commercially-available from Invitrogen and Evident Technologies, but Qdots can be custom generated in a lab environment. If a set is not listed for your specific Qdot, please contact us (tech [at] chroma [dot] com). Flow cytometry is a high-throughput application that allows for the detection of multiple fluorochromes in a sample consisting of thousands to millions of cells in an extremely rapid fashion. These systems utilize very sensitive PMT-based detectors and often use comparatively narrow bandpass emission filters to capture the multiple fluorescences. All flow cytometers use multiple lasers to drive the individual fluorescences, as well as emission filters to block/attenuate the lasers while transmitting the appropriate emission wavelength ranges. However, these systems can differ in their overall optical configuration. Some flow models are linear in their configuration, which allows the operator to use common dichroic mirrors and emission filters designed for use at 45 and 0 degrees incidence (AOI), respectively. Other systems require the use of dichroic mirrors designed for use at other AOI (e.g. 11.25 degrees), while still using common 0 deg AOI emission filters in front of the detectors. Because of the nearly infinite possible configurations and fluorochrome choices available to flow users, we ask people to contact us regarding optimal filter choices for their flow cytometers (cytometry [at] chroma [dot] com). Plate readers, like flow cytometers, are very sensitive devices that allow for detection of fluorescence in entire cell populations, often suspended in a buffer or media. Like flow cytometers, plate readers often use narrow-band excitation and emission filters to detect fluorescence. Since plate readers are non-imaging systems that measure sample-wide numerical fluorescence intensities, narrow-band filters can not only ensure separation of a given fluorescence from others in the sample, but also prevent the saturation of the detector that can often occur with the use of “wide-band” filters. Plate readers can also be used to measure the absorption properties of a given sample (e.g. a Bradford protein assay to measure total protein concentrations of the sample). In these applications, an excitation filter is most commonly used (with or without a matching emission filter) to limit the wavelength range of light getting to the sample. Measurements of absorption are then made by comparing the intensity of light measured by the detector in control (non-absorbent) samples with protein-containing samples, for instance. As with flow cytometers, the possibility of nearly infinite possible configurations precludes us from generating a master list of possible optics. Please contact us to discuss our recommendations. Please see the Astronomy page to learn more.